Lee’s previous trans-Atlantic tours have seen him play at some of Europe’s most important clubbing institutions including, Fabric in London, Watergate in Berlin, City Fox in Zurich, Kiss Klub in Nurnberg and the UK’s Bloc Weekender Festival. He tore up the Toilets in East London for Kubicle, supported long standing friends Wolf+Lamb in Paris and look his, as Resident Advisor described it, ‘libidinous tech funk’ to Bristol, Leeds, Cardiff and Aberdeen. Lee’s live debut at Fabric earlier this year was met with universal praise and Matthew Dear was so impressed with his live show at the Spectral party at the Miami WMC that, he immediately invited Lee to join him as the live face of Spectral Sound, touring alongside Matt over the coming months. In June Lee is set to follow up his Beatport chart topping ‘Love In The Key of Freak’ EP on Get Physical with ‘I Can Hear You Arthur’, his tribute to Arthur Russel on Guy Gerber’s Supplemental Facts label which is set to be one of the summer’s biggest underground anthems. 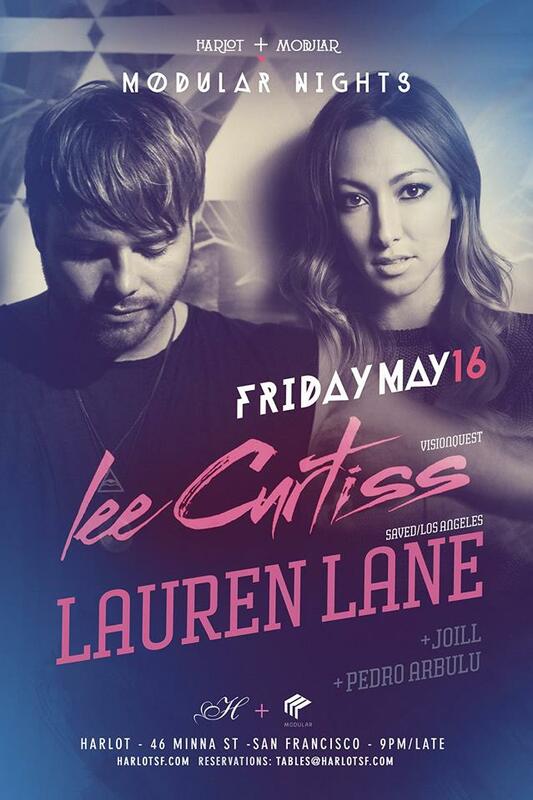 Los Angeles-based artist, Lauren Lane, first cut her teeth as a DJ on the New York house scene and now occupies a sought-after residency at Sound Nightclub in Hollywood. Since Sound opened in January 2013 she has warmed up for numerous, world-renown artists in the ever-evolving industry. Along with her residency, Lane secured a spot at major festival staples such as Coachella, Wavefront Festival and BPM Festival this year. From Visionquest presenting her debut release, “Lazer Eyez” featuring Jaw (from dOP) last year, to remixing “Wild” for Nic Fanciulli, Lane has received support from international DJs including Seth Troxler, Carl Cox, Jamie Jones, Martinez Brothers, and TEED, among many more.